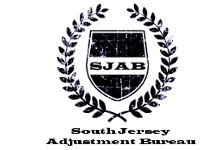 South Jersey Adjustment Bureau Inc. (DiSimone Adjustment Bureau) and it's fourteen subsidiary companies under the direct management of our President, Anthony T. DiSimone is in our fifth decade of protecting insured's in insurance related claim catastrophes including hurricanes, fires, floods, windstorms, explosions, collapses, vandalisms, vessel sinking and fires, aircraft and airport related issues, income losses and other insurable property losses. Our field office personnel in Florida currently had on going operations from Gainesville to Miami virtually from north to south. Our operations in New Orleans and the Bay Saint Louis-Biloxi area in the aftermath of the most devastating nature disaster in this century, Hurricane Katrina, was met with accolades from the most notable religious institutions to members of the states highest ranking members of law enforcement. We have come to the aid of some of the nation's most acclaimed financial notables as well as one of the busiest private jet airport owners in the United States. Working in concert with specialized professional engineers, attorneys, architects, certified public accountants, structural and design experts our firm has lead the way to solving the most difficult of claim resolutions and secured the highest and most advantageous settlements, sometimes under the most adverse of conditions now, entering our 38th year, our team stand at the ready to again take on YOUR part when a catastrophe strikes. We are equipped with the latest state-of-the-art equipment to evaluate the conditions of structures equipment and property when a loss occurs. Our forensic knowledge is such that no potential "hidden" or often overlooked aspect of a loss goes unnoticed. Our knowledge is such that we will uncover every possible extent of loss and utilize the insurance policy so you be fully compensated for all of your loss, even that which does not seem apparent to either the insurance company or the insured. We have a long list of references available to you by request. We work in concert with experts in every field to fully document the loss and the valuation so you will be assumed of full compensation. When catastrophe strikes you need action, not excuses! Anthony Thomas DiSimone is a unique insurance professional. He is among the top 25 internationally known, recognized insurance loss professionals currently handling the most complex of insurance loss catastrophes. This is Mr. DiSimone's 40th year as a Public Adjuster and his 50th year as an Insurance Loss Professional. Mr. DiSimone began his career in a family owned salvage business in New York City, Baltimore and Miami. He was also involved in International ship supply and import/export with an emphasis on insured ocean cargo from all over the world. He dealt with various international companies including The American Export Shipping Lines, Isbrandsion Shipping Lines, Ming Shipping Lines and various cargo shipping companies owned by Aristotle Onasis, the legendary world renowned shipping magnate. He also assisted with a partnership family business with Sir Anthony Eden former Prime Minister of England, as well as the Prime Ministers, Governor Generals, Presidents and Congressional leaders of several Caribbean Nation including Saint Lucia, Saint Martin NV and United States Virgin Islands. He then embarked on starting his own companies. 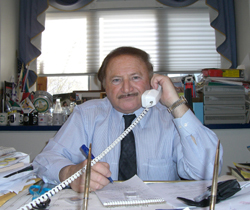 Mr. DiSimone commenced his own Public Adjusting and Loss Consultant Practice 40 years ago. He continued his education attending St. John University, School of Vale Technical Institute, and Orange County College. He has been accredited for licensing from American Education Institute, the senior professional certification program as organized by auspices of an Iowa University Testing Profession under the sponsorship of association of Insurance of Public Adjusters. Fewer than 350 individuals have such professional designation in the world today. He also attended other educational and technical instruction and is certified by Florida Indoor Air Institute as a Certified Mold Investigator. 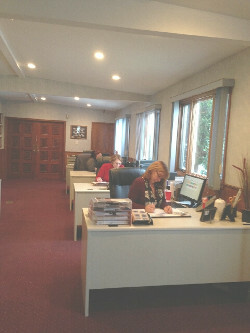 Mr. DiSimone currently is, or previously has been a licensed and bonded Insurance Broker, Realtor, General Contractor and Developer, New Jersey State Legislative Agent, Licensed and Bonded Private Investigator, Commission Member, New Jersey State Task Force on Availability of Homeowners Insurance in Coastal Regions, New Jersey D.C.A. Division Amusement Ride Safety Commission, President New Jersey Insurance Public Adjusters Association, Board Member New York-New Jersey Insurance Public Adjusters Association Board Member, National Association Public Insurance Adjusters, Licensed Certified and bonded in some 14 states and 2 foreign countries and certified insurance loss expert in U.S. Federal, State and Municipal courts in many states and some foreign countries. He is listed in the Who's Who in Executive Professionals. He is currently the Director of the American Association of Insurance Public Adjusters (NJ-NY).